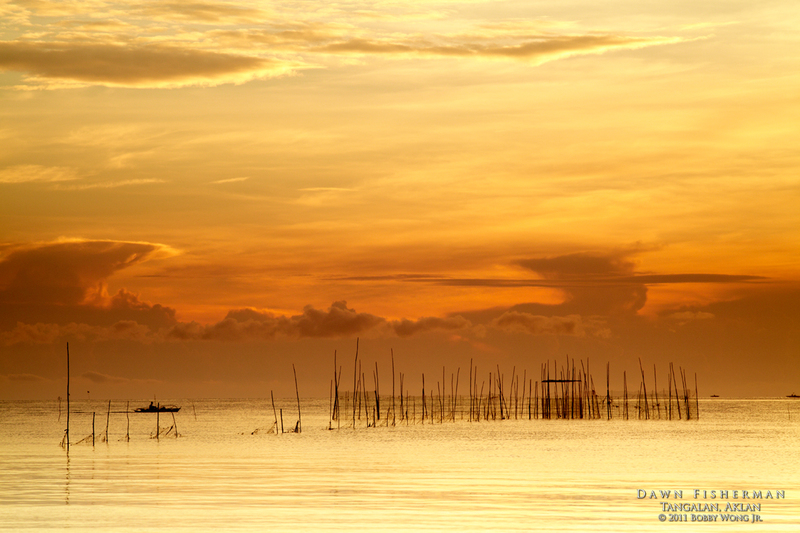 We came to shoot the dawn in the town of Tangalan in Aklan, but it didn't help that we woke-up late. Prudence dictates staking-out the place the day before, to visualize the possibilities and plan our compositions. Or barring that, we should arrive at least an hour before sunrise, as long as we're accompanied by photographers who already know where the best vantage points can be found. But being late, we had to make the best of what we were dealt. When you interrupt a successful routine, you can get temporarily disoriented. But it's often in periods of dislocation, when your mind is free to roam, that incredible opportunity exists. I'd always known the rising sun paints a large swath of landscape golden. I just had to look away to see those possibilities, which in today's postcard, were fish pens silhouetted against an pastel orange sky. A fisherman is headed that way. Imagine. Set-up quickly. Compose. Wait. Click. How did I do? Enjoy. Where in the world is the Tangalan in Aklan?